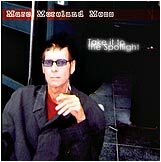 Marc Moreland Mess - "Take it to the Spotlight"
The 1st Single from the album is "HAYRIDE". Marc Moreland was the former guitarist and founder of Wall of Voodoo, which released 9 albums in a little over a decade, notably the hit single "Mexican Radio" in the mid-eighties, before disbanding around 1989. Since then Moreland had been working on various music projects, including his own "Ensenada Joyride" in Europe, and Department of Crooks, which released an album in the U.S.. He had also been involved in film and produced underground bands in the U.S. and Europe. Marc Moreland died on Wednesday, March 13th, 2002 in Paris, France.